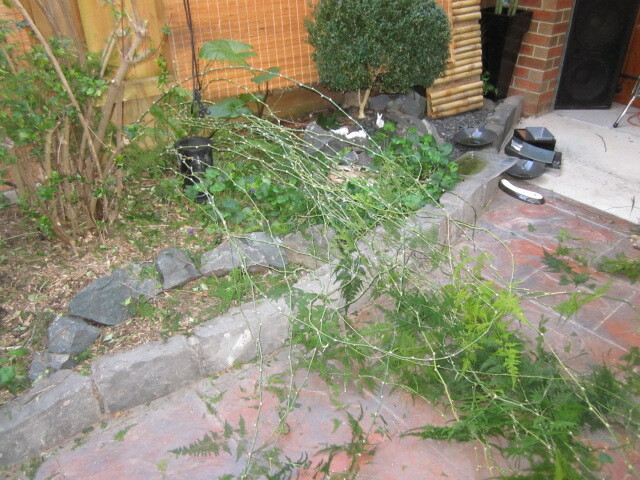 Although the house and cat-sitters did a great job with the watering and looking after Shadow and Zorro while we were away on a cruise, chronicled in travels with princess and quiquinou, weeding was not part of the expectation. We have been back for six days before yet another cruise tomorrow – crazy, but somebody has to do it, and luckily for us, we are those (larger) bodies. Dutchy found time between us attending a wedding on the weekend and repacking to repair our sprinkler system that has lain idle for years, due to the drought of 2009 with its severe water restrictions. 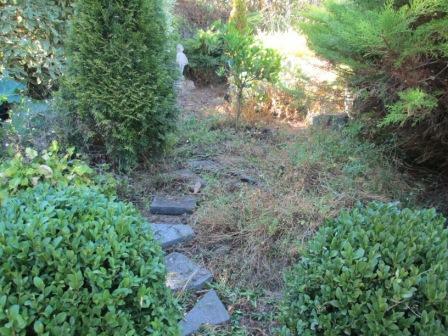 I have managed to spend time out in the garden also, finishing off today with pruning and weeding an overgrown area in the middle tier before we set off tomorrow. Au revoir! All’s quiet on the western front now. 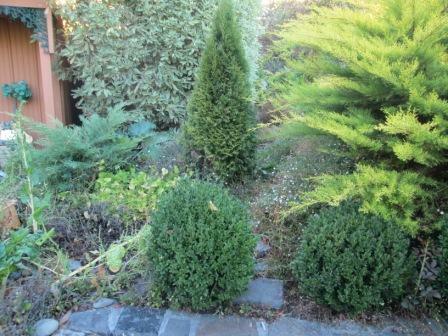 After the prolific pruning on that side of the backyard, we have cleaned up the area. I love the extra light across the grey pattern-paved concrete, although there is still enough height from the remaining conifers to provide some shade. The umbrella, which can be moved around on its cantilever base, can give extra coverage when necessary. 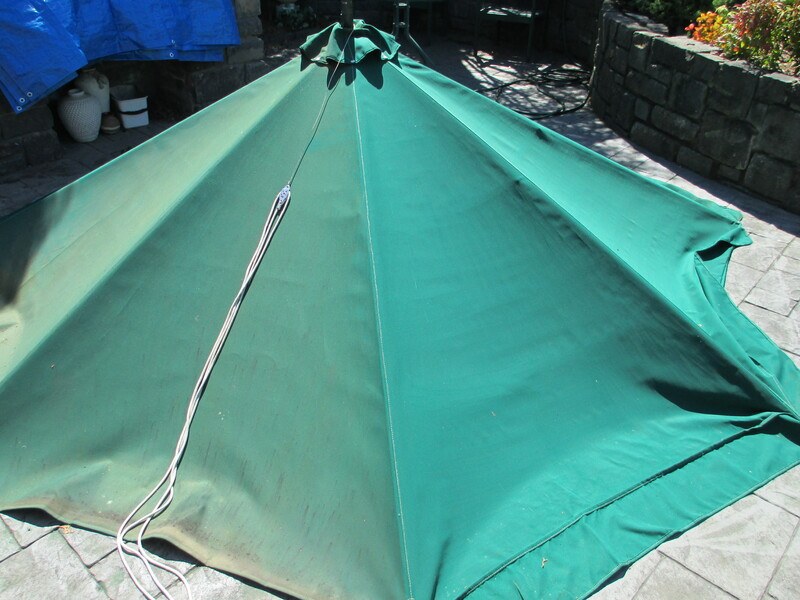 My husband did a great job high pressure cleaning the green four metre umbrella. Halfway through you could already see a big difference. Now it’s hanging back up where it should be, looking almost new again. After the western side was severely pruned yesterday, the job continued with work on the variegated pittosporums on the eastern side, which were in need of drastic action. 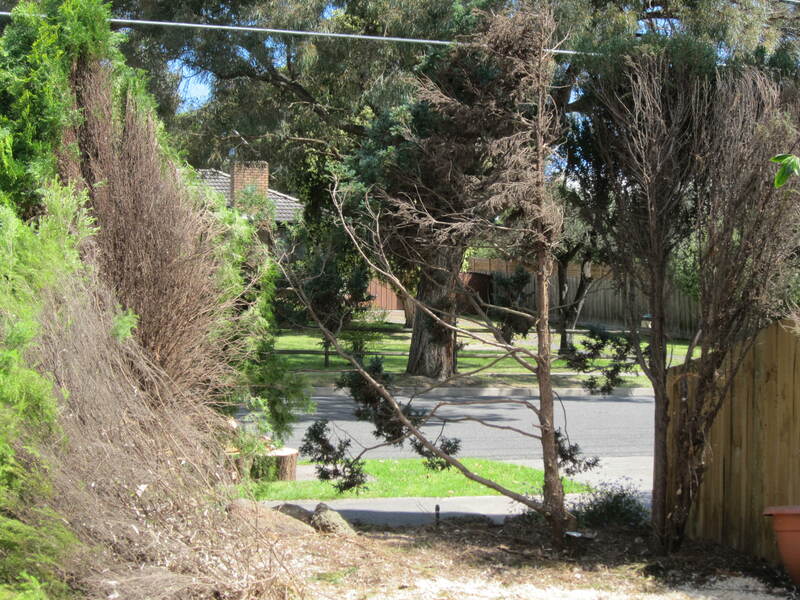 Though I had managed to keep one of them pruned, the others were much larger and I was unable to tackle them. The last piece was about to be lopped as I took this shot. 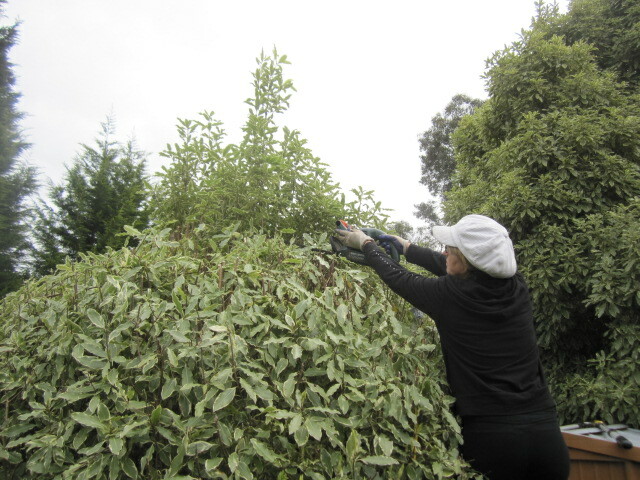 Now they have been pruned to a manageable height whereby I should be able to maintain them. 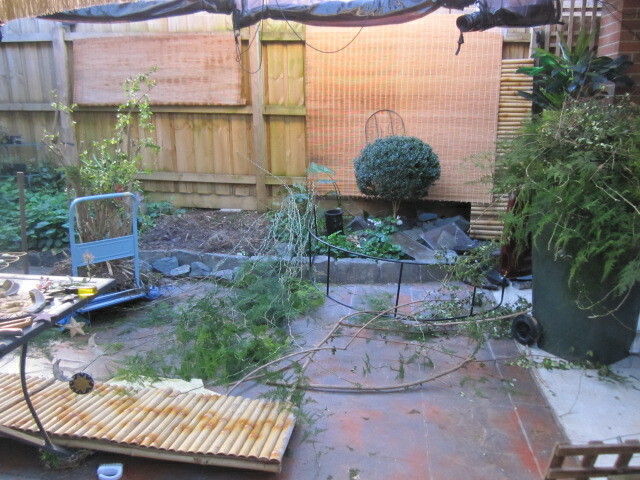 We were very impressed with how tidy Cameron and the guys from Tree Care Services Pty. 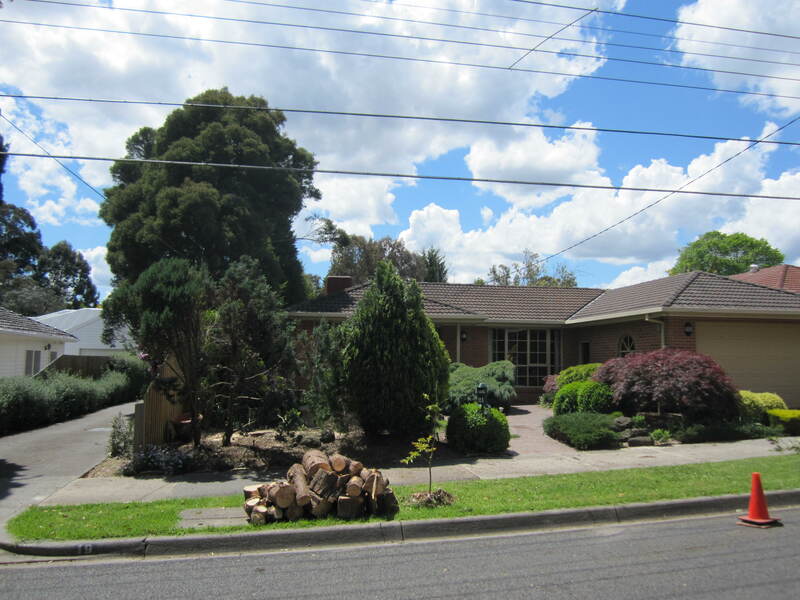 Ltd. in Ferntree Gully left the yard and the garage, which they had used as a thoroughfare to drag branches out to be mulched. When human beings go in for cosmetic surgery, there are often “before” photos. 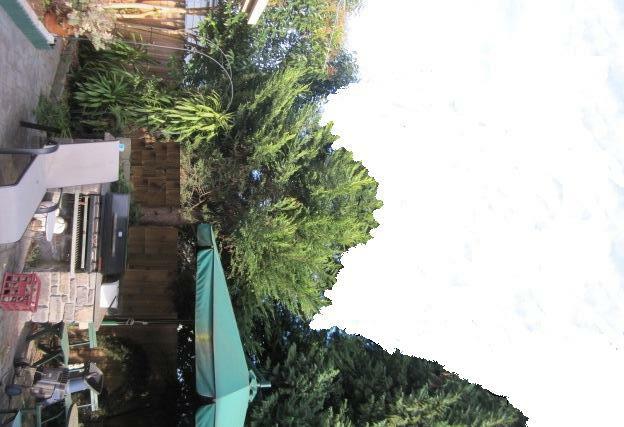 Major work is due to happen in our garden tomorrow, so here are my garden’s “before” photos, showing some rather overgrown trees. The worst part is, we have no-one to blame but ourselves, because when we moved in all we had was a shell on a paddock. 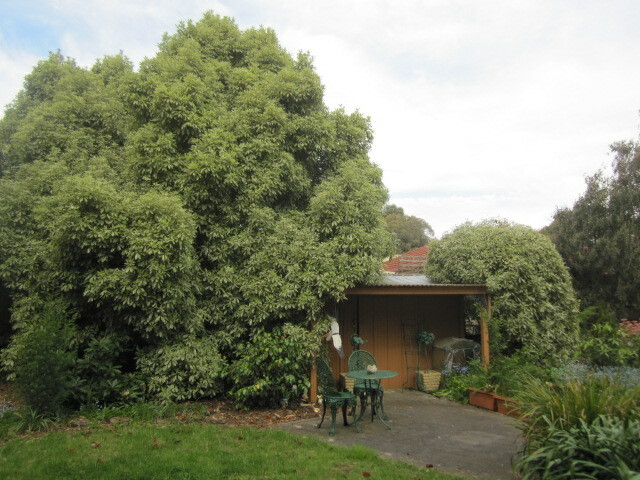 Those conifers must be 15-20 metres high by now, and though they provide plenty of shade in summer it has become ridiculous. Behind the barbecue is a Castewallen Gold, with more of the same further up. Just behind the bluestone wall are two Naylors Blue. 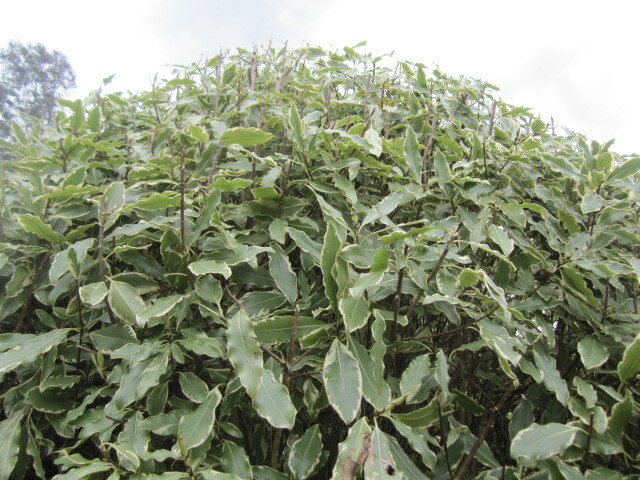 The variegated pittosporum on the other side has grown equally out of control. What were we thinking? How simple it would have been to keep them pruned. Aarggh! This means the backyard gets neither enough morning nor afternoon sun, so drastic action is required. 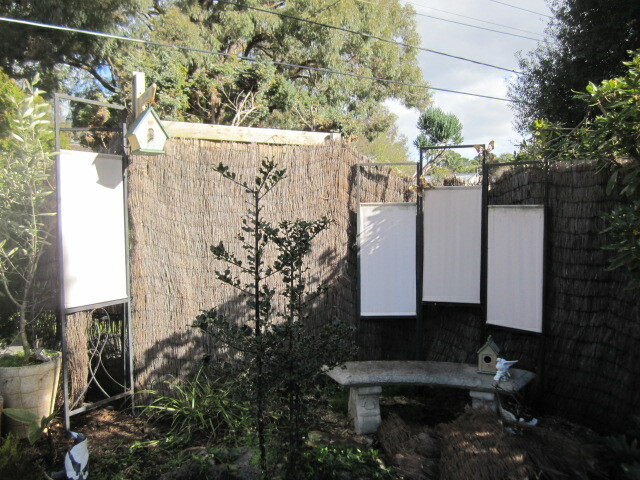 It will open up the back yard a great deal, while still retaining sufficient shade. 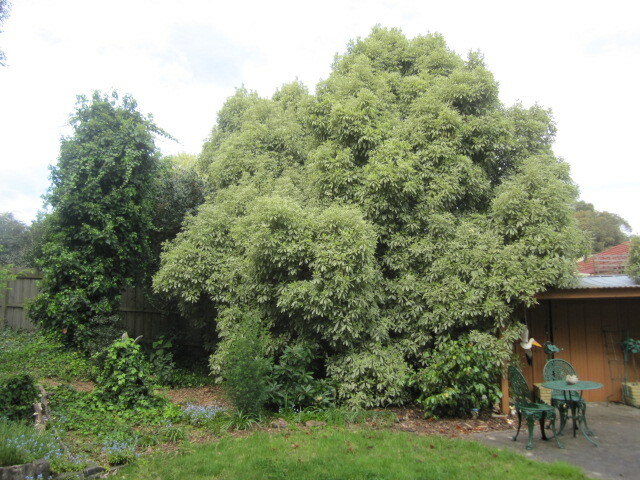 One of the variegated pittosporums in the backyard is manageable as far as pruning goes, although I let this one get a little out of control over winter. Although my husband is taller and has a longer reach, I decided that I had to do it all by myself. 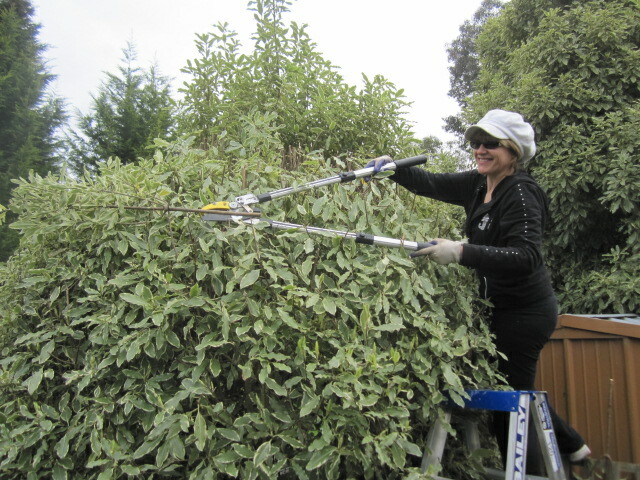 Using a good strong ladder, an electric hedge trimmer and a pair of extendable loppers, I managed to complete it. It may not be perfect, but perhaps practically perfect fits the description. It conjures up pictures of Mary Poppins and her umbrella, doesn’t it? Let me start by saying I would never actually eat an elephant, nor would I wish to. It is merely a metaphor. How would you eat an elephant? One bite at a time. This is how I approach my garden. Though it is only a suburban garden, and not acreage, it is nevertheless quite sizeable, especially now, in days when blocks are getting smaller and smaller. Ours is just under one third of an acre, or 1284 square metres. 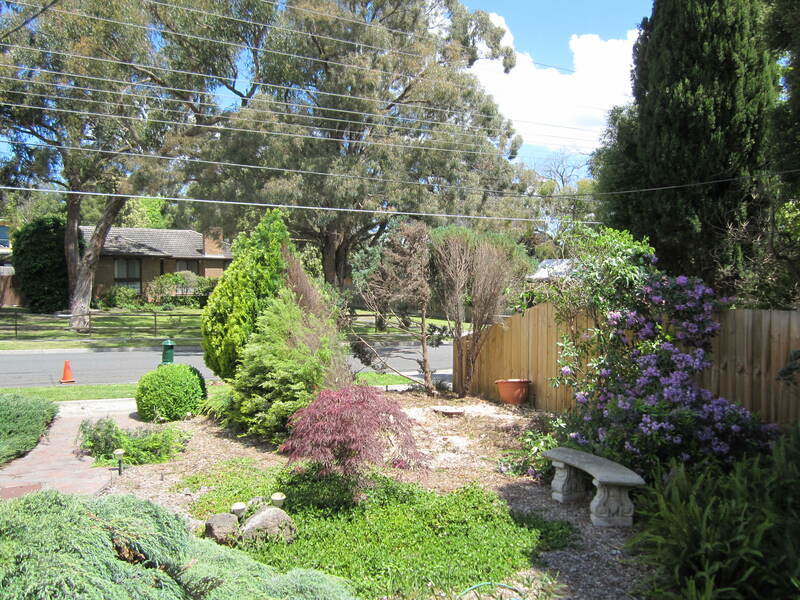 Over the twenty-seven years we have lived here, starting with a shell on a paddock we have extended and expanded, landscaped and concreted, to achieve a rather lovely environment, even if I do say so myself. It seems to be a neverending task, or labour of love as I think of it. 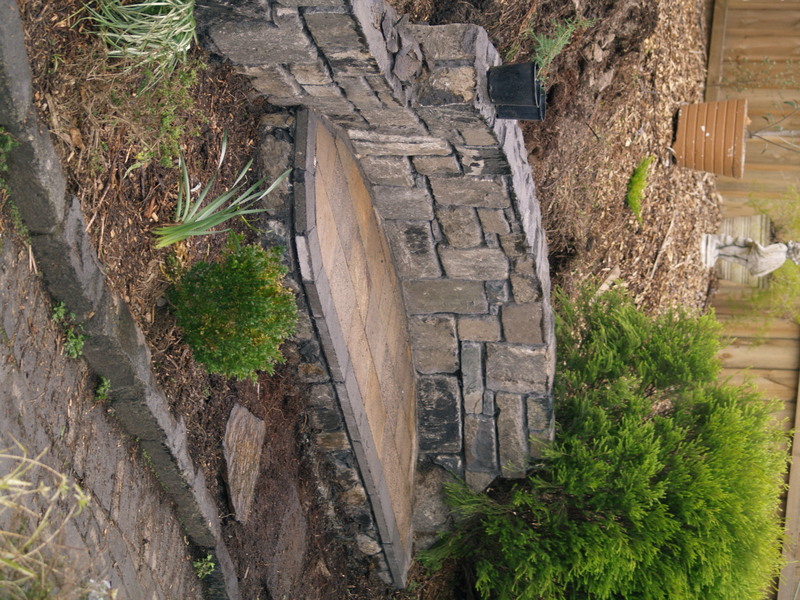 There is still so much scope for more landscaping ideas, creating interesting corners in the garden, which are always so much easier in my head than actually doing them. But there is always maintenance, even in areas that are considered “finished”. 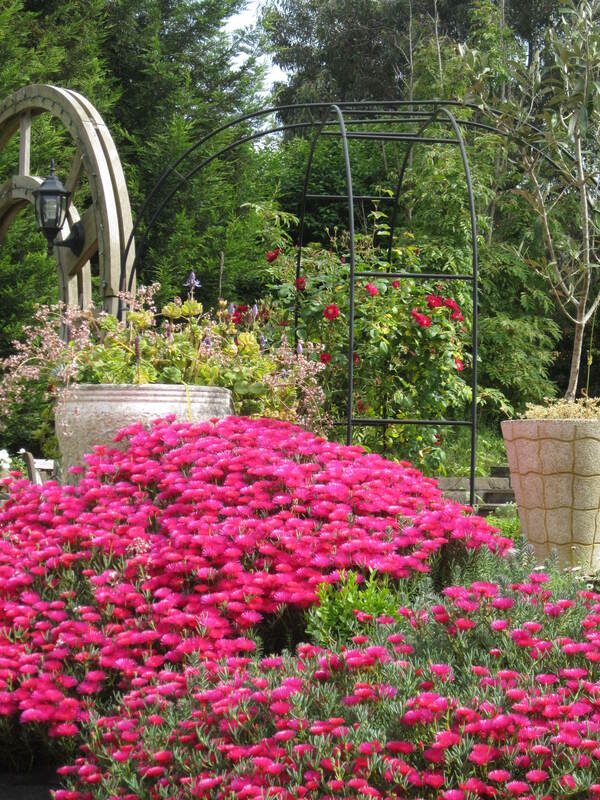 Is anything ever really finished in a garden? The way I tackle it is in stages. I get overwhelmed if I just look at everything at once, to the point that it immobilises me. 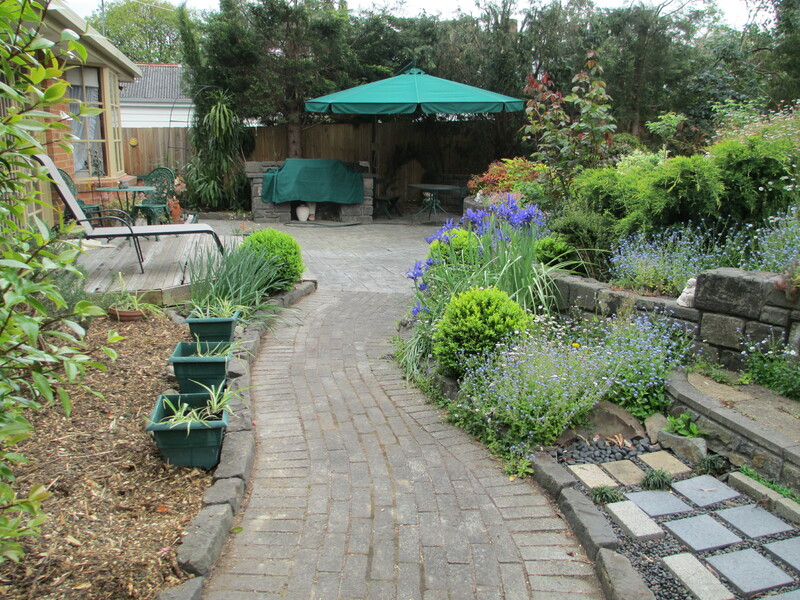 By compartmentalising my garden, I avoid that immobilisation, by dividing it into different areas, particularly for maintenance tasks such as pruning and weeding. By cutting it up into bite-size pieces, it is an achievable challenge, just as you might do if you did attempt to eat an elephant. 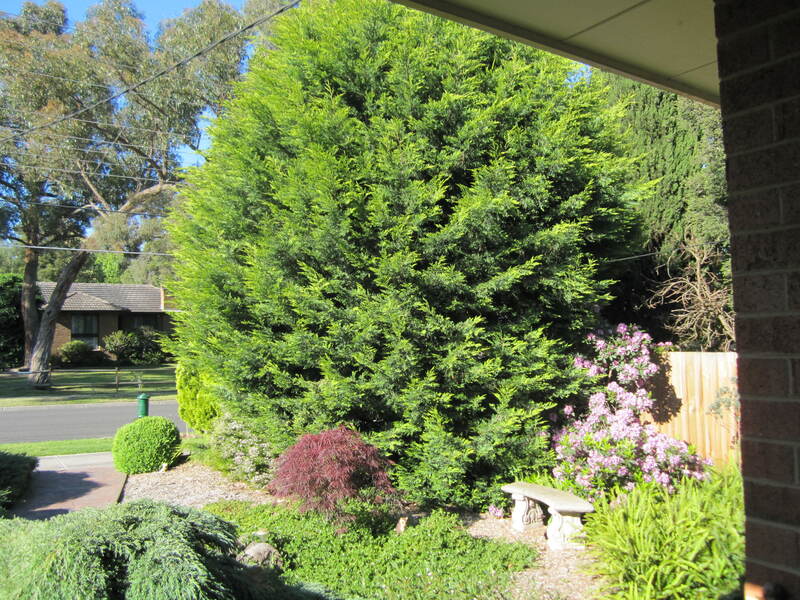 The huge conifers down the western side of the back yard have become a problem. While we grew them in the first place to provide shade from the hot afternoon sun in summer, we never realised how large they would grow. Behind the bluestone barbecue is a Castewallen Gold, and behind the bluestone wall that separates the bottom and middle tiers, are two Naylors Blue and another Castewallen Gold. Further up in the middle tier are yet another two of the Gold. Don’t get me wrong; they are still beautiful and majestic, but just not suitable for a suburban garden. 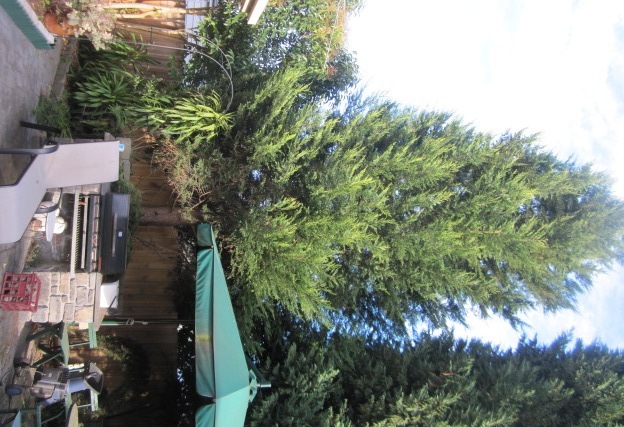 I have spoken about my indiscriminate love of conifers, and the price we have had to pay in removing them. This time I have done my own artist’s impression of potential changes. I am new at computer graphic design, so it is quite rudimentary, but it still gives one the idea of what I want. Especially if I want to grow vegies, I need a lot more sun in the garden. The Cyclone Sandi to which I make reference is a non-meteorological one. It relates to the mess I have made of the patio. As I mentioned the other day, all I was going to do was put some more pebbles down,but I got carried away. However, after I pruned the bush I realised it no longer suits this spot, particularly if I am going with the tropical theme, so I made the executive decision to pull it out. Since my husband was at work, I couldn’t utilise his strength, so set about it myself. 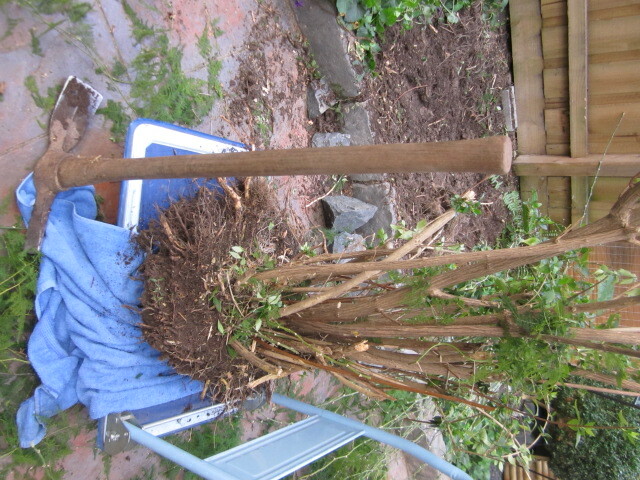 Every now and then I would go outside to tackle it in stages with my trusty mattock. Lots of swinging meant I had to have regular rests, but eventually I loosened it all enough to get the plant out, leaving that area ready for some palms. Goody, goody. A little more research and I’ll be good to go! 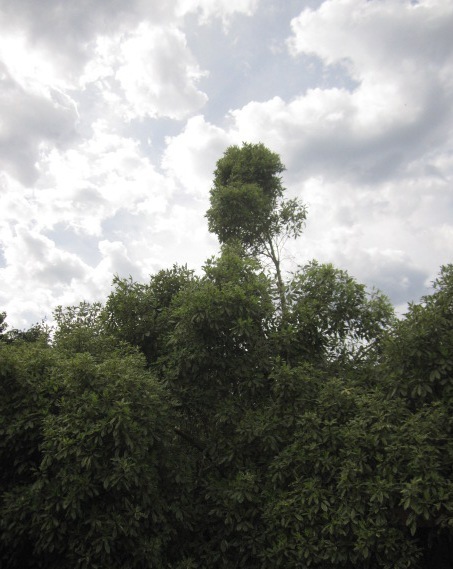 On this day, way back in 1985, we planted our first tree on our almost one third of an acre property. 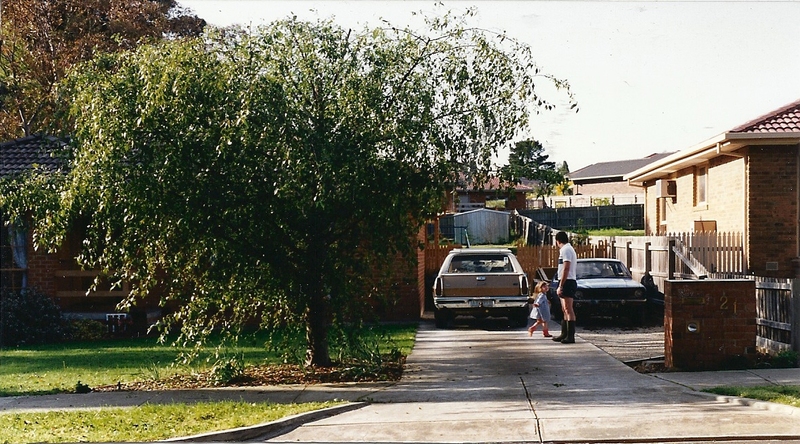 Our house was a shell on a paddock in those days, and I love looking at the old photos to see how much progress we have made. As I have mentioned before, a garden is in a continual state of evolution. 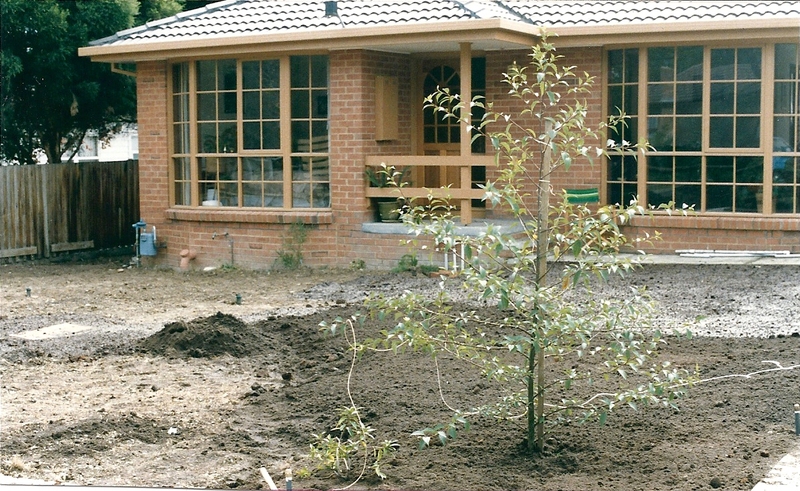 An Evergreen Alder, alnus-jorullensis, took pride of place at the corner of the front yard and concrete driveway for twelve years. What happened to it after that? Stay tuned for another exciting instalment of 366 days and 26 years in my garden! 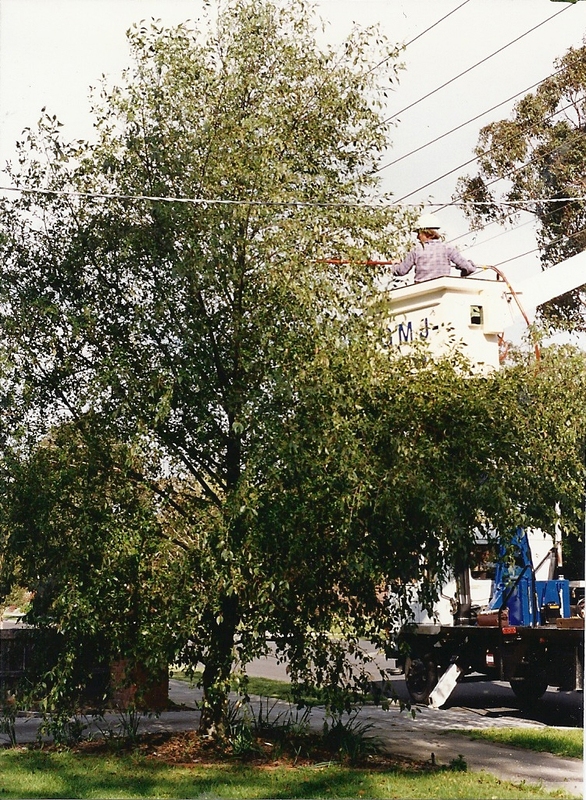 By September 1990, the tree had grown so big that it was in danger of interfering with the power lines, something we had never even considered when planting it. 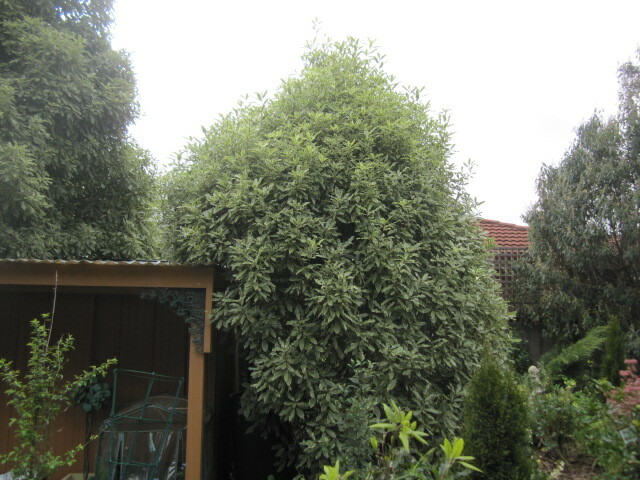 Thinking about how large and wide a plant will grow when choosing its position in the garden is a lesson well-learned. The change to its shape gave it quite a different, although still attractive, look. Autumn is here, apart from this unseasonal lovely warm weather, so I am expecting the hues of the trees to change in the next month or so. Back in 2009 when we planted the third weeping Japanese maple (Inaba Shidare), in what used to be the lawn, the Castewallen Gold was not a threat. 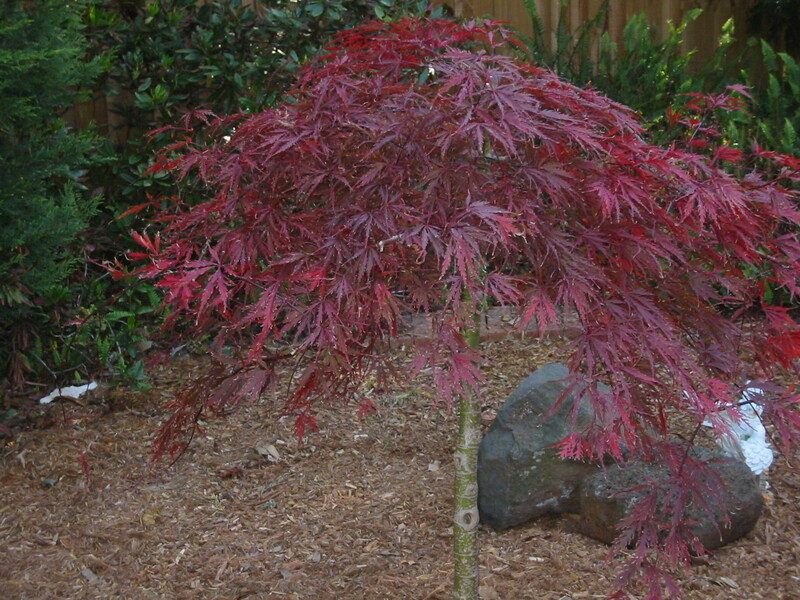 Later, I had visions of its lush growth impinging on the maple, which, at $150 for the specimen, was too precious. 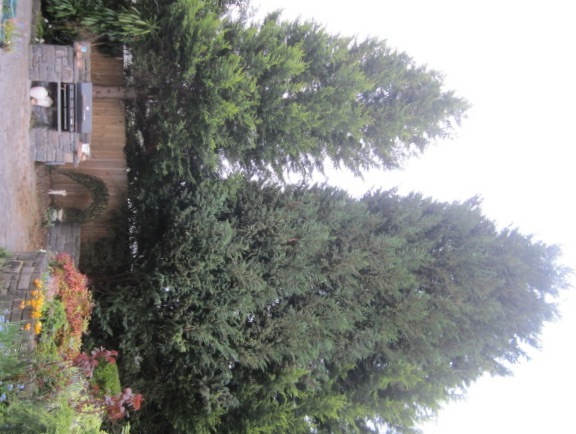 Removal of the very large conifer, in November 2010, cost a lot more than the price of the tree, but gave us more space in the front garden. Later I created a nice little corner that I can view from our bedroom at the front of the house. 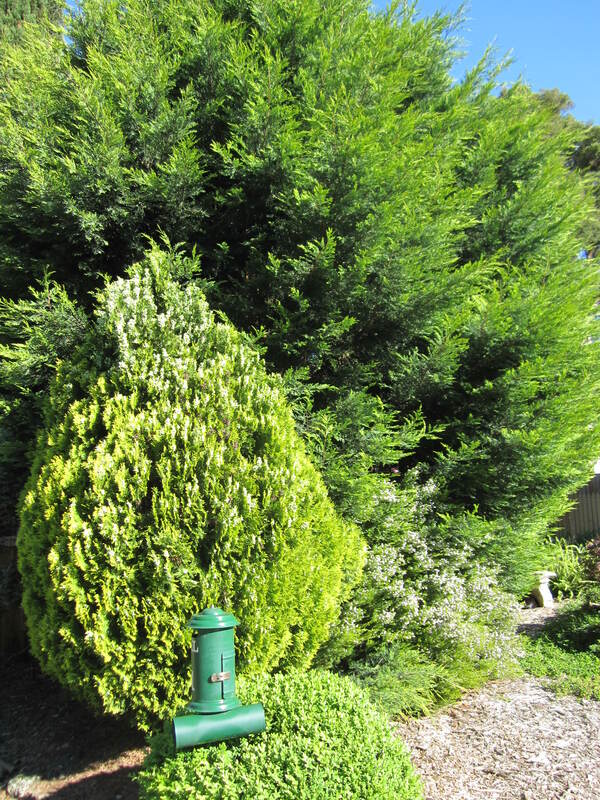 The Castewallen Gold dominated the Morgan dwarf conifer near the letterbox, but once it was removed, suddenly the twenty-odd-year-old conifer looked large. Size is relative.